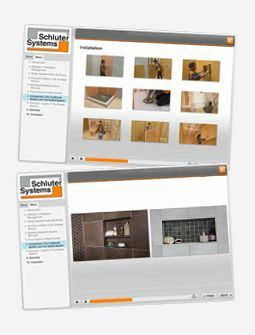 The Schluter®-DITRA-HEAT membrane is selected according to the size of the area to be tiled. The DITRA-HEAT-E-HK heating cable is selected according to the size of the area to be heated. Be sure to measure the heated area accurately. Heating cable placement is limited by minimum spacing of 2" (50 mm) from walls, partitions, and fixed cabinets, 8" (200 mm) from heat sources such as baseboard heaters, fireplaces, forced air heating ducts, etc., and 4" (100 mm) from plumbing drains. Minimum spacing from centerline of toilet drains is 7" (180 mm). Select a heating cable close to, but not more than the determined heated area. Do not purchase a heating cable the same size as the area to be tiled; this will be too much heating cable. The heating cable cannot be cut to fit or installed under fixtures in the event that it does not fit the application. Cutting the cable will change the resistance and could result in cable damage or fire. Installing the heating cable under vanities, bathtub platforms, free standing bathtubs, kitchen cabinets and islands or other fixtures or in closets can result in excessive heat buildup in these confined spaces and may cause cable overheating. It is helpful to plan the location of a buffer zone, as it is not possible to predict where the heating cable will end. The buffer zone is an area where heating is not essential, typically behind a toilet or adjacent to a door opening. This area allows for placement of excess heating cable. Heating cables may be installed 6" (150 mm) from the wall to allow for additional buffer space. To help determine the proper heating cable size for your application, please review the Schluter®-DITRA-HEAT Calculation Sheet and use the DITRA-HEAT Online Calculator.